Preheat oven to 250°F (175°C or 180°C). In a medium bowl, toss the blueberries, chopped strawberries, raspberries, agave syrup and starch together until the berries are evenly coated in the mixture. In a separate bowl, mix together the flour, oats, egg, agave syrup, baking powder, and salt until combined. Add the butter and crumble it in with your hands until there no large clumps remain. Remove a 1/3 of the crust dough for the topping and set aside. Press the rest of the dough in a medium tart tin. Add the blueberry mixture onto the crust, leaving any extra liquid from the berries in the bowl. 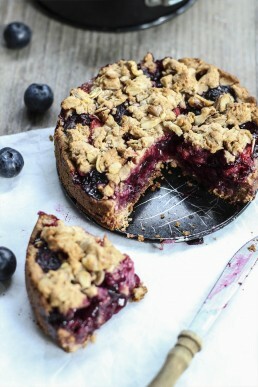 Add the chopped walnuts to the remaining crumble dough that you set aside earlier, and sprinkle on top of the berries. Bake for 40-45 minutes, until the crust is golden brown.